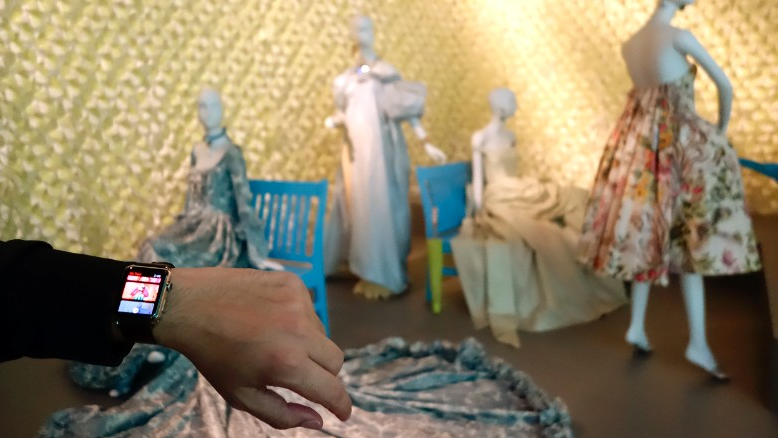 Image: A visitor holds up an Apple Watch at the Oscar de la Renta retrospective at the de Young Museum. San Francisco’s de Young Museum has a new, innovative way for visitors to experience the museum. The project was created by Guidekick, a startup and expansion of the de Young’s phone app. There are plenty of great things to see at the de Young Museum in San Francisco, including southwestern Native American art donated by businessman Thom Weisel and a current retrospective on fashion designer Oscar de la Renta. When visitors pass the fashion exhibit, the Apple Watch will vibrate to let people know there’s an audio track they can listen to. If users choose to listen, they can hear the designer himself talk about his work and influences. The app will use a Bluetooth component to narrow down exactly where visitors in the museum are so it can alert them to audio options. Then, with headphones, visitors can explore a part of the museum they wouldn’t otherwise have access to. The de Young Museum is one of the first to use watches—or wearables—like this, though many museums offer audio companions. The watch is meant to act as a kind of “invisible tour guide,” says Richard Benefield, active director and chief operations officer at the de Young. The “guide” can provide guests with information about the different exhibits without being a distraction to them—it’s kind of like an on-demand educational service, only put into use when necessary. The new Apple Watch technology was announced by the company earlier this week at the de Young. The event was for a host of companies and builders putting together apps very like this one, bringing technology to art and vice versa. The museum hopes to offer more services like this one in the future, and there are likely to be more opportunities, as San Francisco is very close to Silicon Valley. Benefield has encouraged others to approach the museum with innovative ideas. “I’ve made it known to Silicon Valley: our museum is your laboratory,” he said.